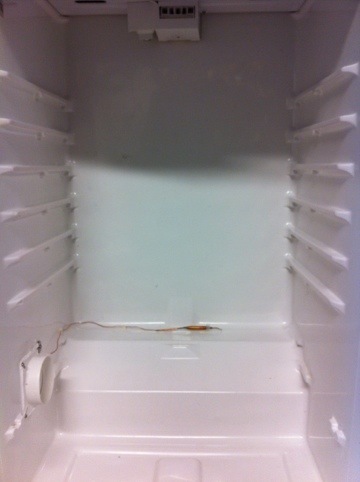 My wonderful ex-refrigerator that was turned into a larder needed a functionality face lift. 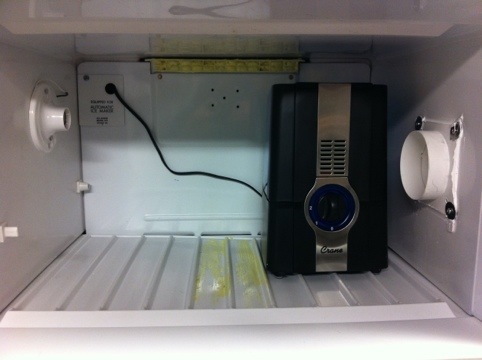 My temperatures were accurate but the larder was inefficient when it switched on and off every second. The PID controllers allow more precise control when it comes to temperature and it is more affordable. To get this done I invited my sous chef and lead line over, and after a six-pack of beer we were able to successfully attach the PID controller. The wiring took a moment of thought, just trying to remember what all the abbreviations meant from the last project I used a PID on was the most challenging. 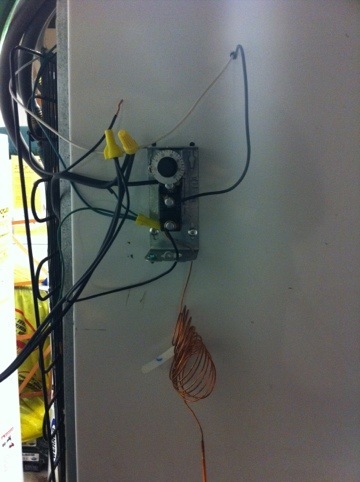 Once we deciphered the little black box we began to disconnect the old thermostat and plug the wires into the PID. This should be all you need if you have extra 16 gauge wire, if not pick up another roll of white and black. Unplug your main power source so you do not get zapped! When you remove the old thermostat make sure to mark the three wires: Red = Hot from wall, Blue = Light/heat source hot, Yellow = Condenser hot. 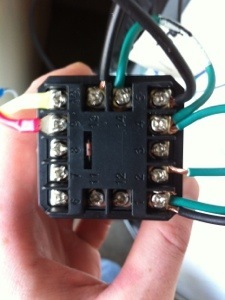 Looking at the back of the PID controller the picture below shows where the wires will go. 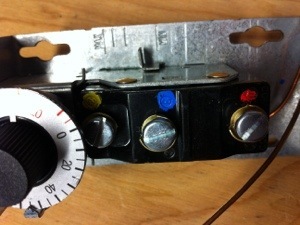 Thermostat: Starting on the left with slot 9 and 10, plug the red end into 9 and the yellow into 10. Looped green wires: You only need a short wire for these next two. One end goes into slot 14 and the other goes into 4 with the start of a second wire, this second wire ends at slot 1. With slot 1 is your main power from the outlet, therefore the one that was RED going into the old thermostat now goes into slot 1. Neutral, normally white but since I ran out of wire I made it green, this will go from slot 2 on your PID to the cluster of neutrals anywhere in the circuit. Here you can see that I have my neutrals bundled and my ground wires bundled, again the wire going from slot 2 will connect to the neutral bundle. Slot 1: Main power line from the wall and one wire ending at slot 4. Slot 2: Neutral, this wire should join the rest of the bundle of neutrals. Slot 4: The end of the wire from slot 1, and the beginning of a wire that will be looped to slot 14. Slot 5: Hot wire from the heat source. Slot 13: Hot wire from the condenser. You should now have a PID controller that will turn on and off a condenser and a heat source for your larder. The benefit of having a PID is that it can be a lot more precise with a smaller margin of error. 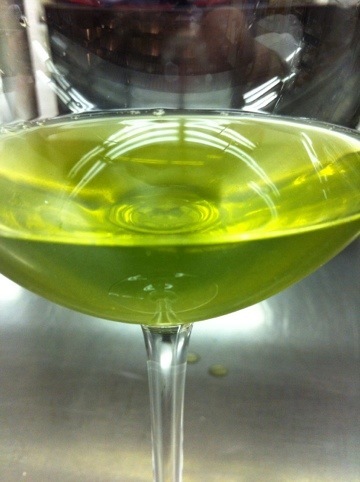 Since I put it in my larder has kept a steady 58° with very little fluctuation in temperature. Next step is to program the little black box, this took me a while to figure out what all the abbreviations meant and how to properly set it up. As long as you are using the K-type thermostat that I linked at the top, then setup is very easy. Now my device was already set to Fahrenheit but we will check it anyways. (4) Press ↓ or ↑ to select the new parameter, press until it reads CorF. If it reads 0 then you are in Celsius, if it reads 1 then you are in Fahrenheit. Once that is set up exit back to the display. Now we will set the temperature parameters. 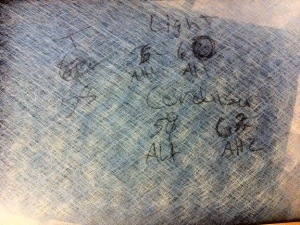 I will simplify this chicken scratch below, all I had at the time was a sharpie and an air filter. This is the number that the condenser will turn on at, yes it is reverse thinking seeing how the next value AL2 (Absolute Low) is a bigger number. This is the number that the light/heat source will turn on at, yes it is reverse thinking seeing how the next value AL1 (Absolute Low) is a bigger number. 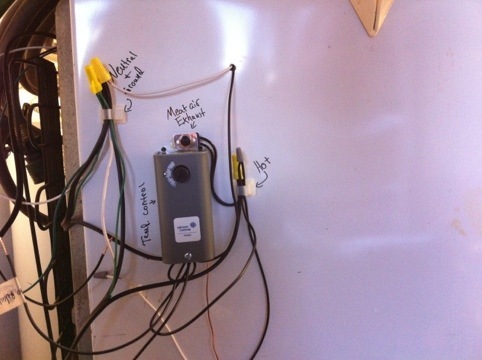 This completes my installation and setup of a PID controller to my larder, you can see my original post here. Feel free to contact me with any questions or thoughts on how to make the larder more efficient. The larder is a cool room, usually built off of the kitchen where food was stored before the use of refrigeration. Some larders were as big as a standard garage and others could have been as small as a modern-day refrigerator. They were used to store perishable foods and large pieces of meat to help preserve them for a few more days. I have begun to get deeper into the world of charcuterie and have found myself curing meat in a fridge that is barely below 45°F. When curing muscle, the ideal temperature is between 55°F and 60°F, with humidity between 60% and 70%. I have read that wine coolers are ideal but for my purposes, it might be a little small. Aside from curing meat, the box will be the perfect tool for pickling by fermentation, making sauerkraut, and producing many other culinary delicacies. I started this project with a top freezer refrigerator, I am not sure about the cubic footage. After a lot of horrible drawings, and many ideas of how assembly was going to work, I started modifying the refrigerator. To begin, we remove the doors of the fridge and freezer and started pulling the paneling out from the inside to revel its inner working. As shown below, all of my complicated ideas were simplified by understanding how the unit works, and I couldn’t have ask for a better fridge. Straight back, above the condenser, is where the fan housing was mounted, which I kept, and the rectangle hole actually vents down to the refrigerator. The positioning of the fan and the condenser couldn’t have been better. The freezer portion of the box is where I will put a humidifier and a heat lamp to heat and keep a moist environment in the lower box. I took some canned foam sealer and sealed the top vent on the fan housing so all of the heat and moisture will go to the lower box. Back of the fan housing. I filled the vents with a foam sealer and place a piece of stiff foam on top to prevent the vents from doing their job in the freezer. After a little more digging we found three screw holes on the left hand side for mounting an ice maker, which again was very convenient. Two of the holes were used for mounting the light socket for heating and the other was used to feed wire through the walls of the fridge. 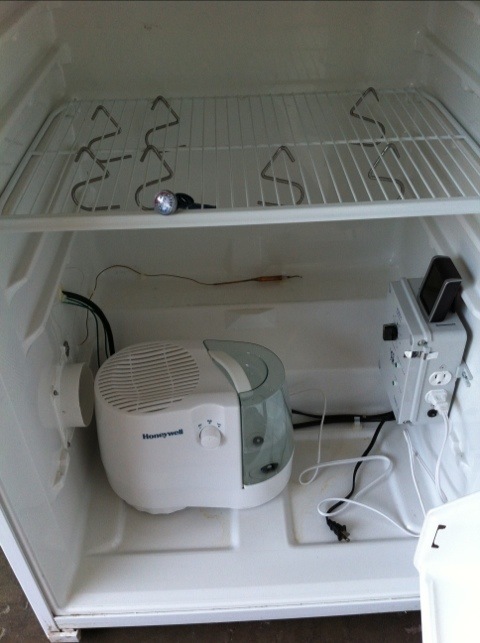 We also unplugged the wiring hole for the ice-cube unit, the yellowish circle in the top right of the freezer in the top picture, and fed the wire through there for the fan. Next, I drilled a couple of holes in the side, just below the exit hole for the lamp wires, and I installed a thermostat, The thermostat is from Johnson controls and can be found on Amazon. I just used rivets to mount the thermostat, and began deciphering the instructions for what wires went where. 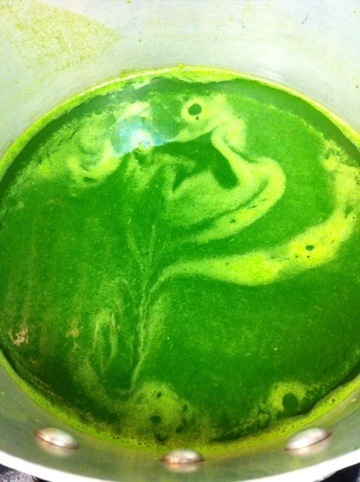 Sometimes the instructions can be confusing when it says on temp increase use this and on temp. decrease use this color. First step is to cut the power cable to the length it needs to be to reach the thermostat. Break up the wires and you should have three, mine were two black and one green. 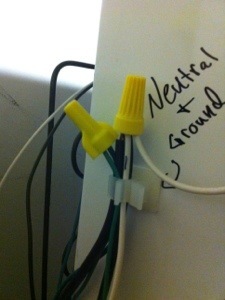 The green is your ground wire, and the two blacks are a hot and a neutral. 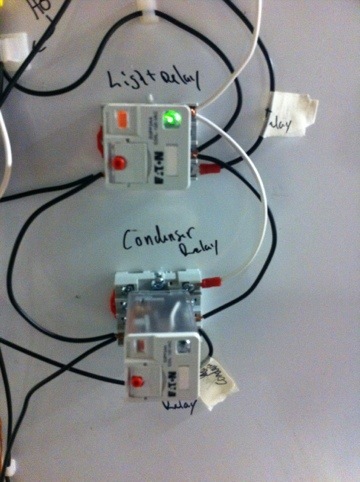 You will need to determine which wire is the hot and which is neutral, the right side of the wall outlet is the hot. Wire nut the grounds, and the neutrals together, you should be left with only hot wires. I will break it down so it is a little easier to understand. There are three connections; Red, blue, yellow, in ascending order. The Red is your HOT this is where your main power will go in. The hot end of your heat light will go onto the yellow screw, this screw will tell the light to turn on when the box is too cold. 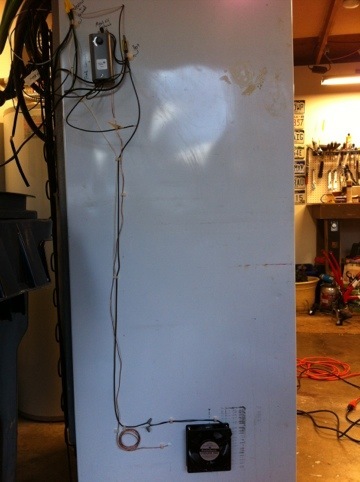 The hot end of the condenser, coming out of the back of the fridge, will go to the blue screw. This screw tells the condenser to turn on when it gets too hot. The fan is the only item that I do not have connected yet because I need it to turn on in two separate situations but I do not want it running all of the time. I will need to look into a relay of some sorts to get this installed. Mounted and half wired thermostat. 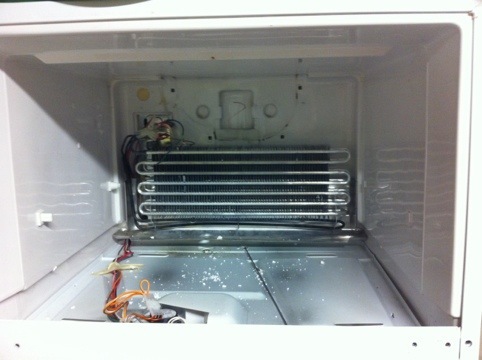 Once I tested the functionality of the thermostat and the accessories, I began to reassemble the freezer parts. Functioning light fixture and fan to move the warm and humid air. 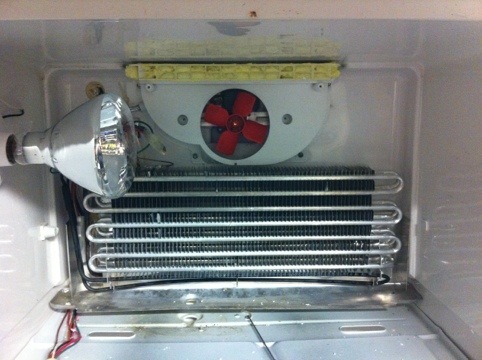 Next to be put on is the guard for the condenser so it wont cool the upper box, where it should be warm. The yellow foam above the fan prevents cool air from moving into the warming box. 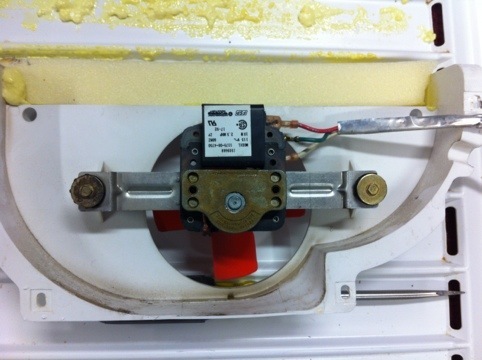 The freezer is now reassembled and the vents have been caulked and secured with 3″ screws with locking nuts. 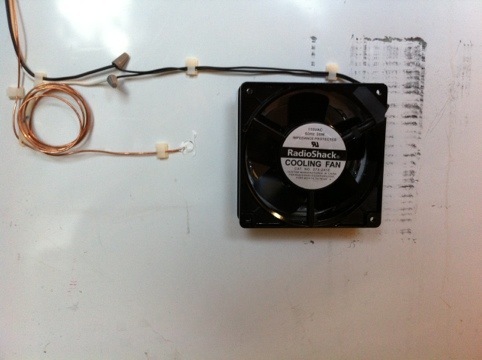 I added the humidifier and ran the wires out the back with the fan wires. 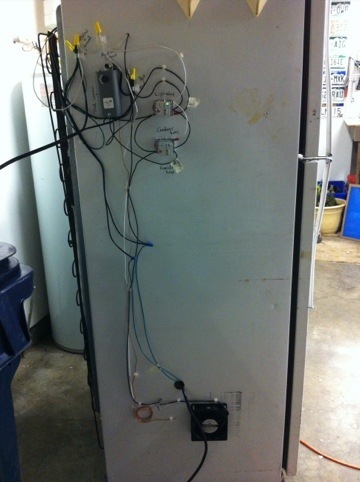 At this point I am waiting on a humidistat and some relays to get the humidifier to work properly; until then I did some wiring organizing and ran the thermostat probe into the main housing of the fridge, where the meat will hang. A cleaner view of the wiring. I fed the probe in next to the exhaust fan and placed it on a small shelf about 3/4 of the way down, on the inside of the fridge. I secured the probe with some plastic wire clips so it doesn’t float around. After I ran the probe, I wired the exhaust fan into the main power and onto a push button switch so I can clear out the air in the main fridge when necessary. I want to make sure that there is clean and fresh air in the fridge as much as possible without opening the door. I will also install filters and guards on the vents to prevent anything unwanted from getting in and contaminating the food. In order to get the circulating fan to come on with each of the three components (fridge condenser, heat lamp, and the humidifier) individually I needed to wire them into some relays. I picked up two of the relays at my local wholesale electrical supplier. The 8-pin relays were the closet thing I could find as no one had a single throw relay. There were a few wasted terminals but everything works. To get the fan to work with the humidifier I spliced the hot wire for the fan into the plug for the humidifier, which was plugged into the humidity controller, basically its own relay. Next I fed all of the wiring for the humidity controller through the fridge, plugged everything in and did a quick test run. The test run proved that everything worked accordingly and the only thing left is to clean up the last few wires, get a surge protector to plug the humidity controller into it, and do a full run to make sure that I do not have things turning on when there is only a degree of difference in the box. Full side view of the electrical workings and setup. After doing a test run I realized that I will need a third “ice cube” relay box for the humidifier to turn on properly with the fan. The surge protector is mounted and we are ready to make a second test run for a 24 hour period. 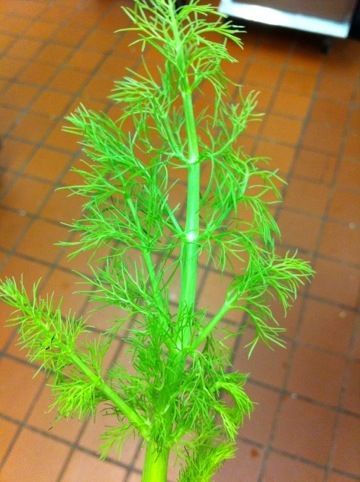 So after a few weeks of crazy work and being sick I got back into the larder. I have realized that the warm air humidifier was not the right choice, during the cooling process the warm air fought against the cold air and was very inefficient. The next change was moving the new cold air humidifier to the lower part of the box. By moving the humidifier to the lower box I have eliminated the use of the last “ice cube” relay box because I do not need the fan to turn on with the humidifier. The larder is now a lot more efficient and keeps the humidity and temperature very well. Instructables.com has asked me to post a guide on creating black garlic, and of course I did, and I entered it into one of their competitions. So please help me out with your votes for the next few days! 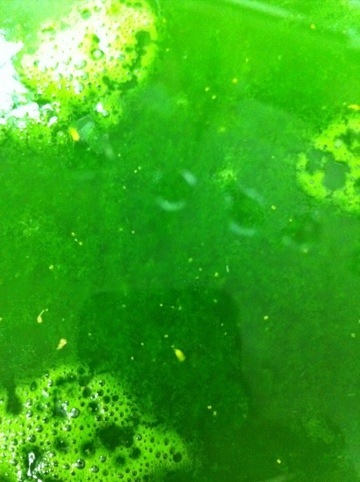 A new batch of garlic has almost finished and I have found something very interesting. I started by buying 5# of garlic to see how large batches would turn out. I then bought two rectangle cake pans to use as my vessels, and some stacking drying racks to put the garlic on. I loaded up the two pans with the garlic, a single layer, do not stack or it could cause uneven “cooking”. I then put a piece of foil on top of the pans and then wrapped them very well with plastic to ensure that the moisture would stay in the pan. After 30 days I ended up with incredible results, the garlic was a deep black, smelled great, and didn’t have any bit of bitterness to it. Unfortunately it was only to the top pan, the pan underneath didn’t get the proper heat, so that pan went back in to cook for a little longer. But to find that the pan on top was beyond perfect is amazing to me, I removed the garlic from the pan and set it on the drying rack, which will remain there for a few days. Below are some pictures of the garlic before it has been dried and a picture of the new setup. The pan on top was the pan on the bottom, it needs a few more days to cook. The garlic below it is drying for a few days to intensify in flavor. The garlic needs a few days to dry to make it easier to store. 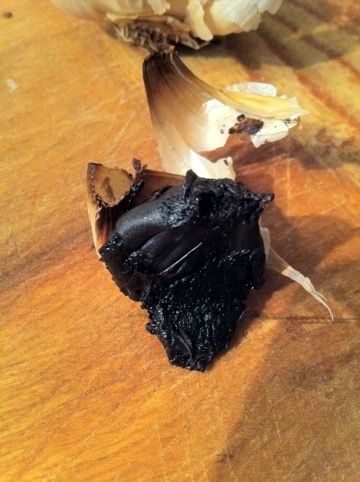 Since the day I paid $30 a pound for black garlic I was mesmerized by the process and the flavor. I wanted to know how it was done and how I could do it myself. 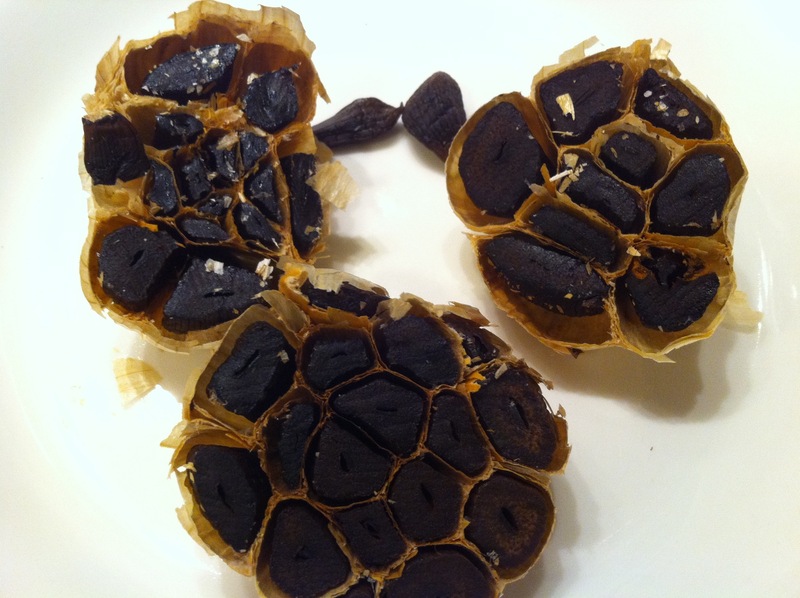 The actual process is posted vaguely all over the internet but the creator of the name brand Black Garlic has kept his process a secret. He has built a patented “machine” to produce this garlic that has been kept quiet, at least I haven’t seen any information on it. So after reading numerous posts about making black garlic I decided to tackle this project, and since I had and old hood fan from my stove and a non-functional wine cooler, I figured I could build a warming box to re-create black garlic. Using these two items and a thermostat I was able to build a heating box where my garlic could stay nice and warm to allow fermentation. The whole heads of garlic were placed into glass mason jars, which may not be the best choice but at this point it was the best option until I understood what was going on. After a few trial runs I realized that the garlic would ferment and turn brown with little effort in about 30 days. After a full 40 days, which is the amount of time to ferment the garlic, I found that it never turned black. I removed the lids of the mason jars to see if that would help in any way, and after 15 days of that my garlic was black and hard as a rock. This rock hard garlic made me realize that I had built a very large-scale dehydration box, and that the garlic was in the open air too long. I immediately rushed to the store and bought more garlic to start the second round of fermenting. This time I had four different tests going to figure out when and how long the garlic needed to dry for. After 40 days the end results were beautiful, I had two products that were black, one that was brownish black, and one that was black and hard as a rock. From Left Clockwise: 30 days in the mason jar and 10 days drying, (2 cloves) 5 days in the mason jar and 5 days drying, 7 days in the mason jar and 3 days out drying, 8 days in the mason jar and 2 days drying. At the end I had three usable products out of four, which is pretty good, I used the soft and dark cloves in sauces and marinades, and the hard dried out garlic was ground up in a spice grinder to make a very pungent black garlic powder. This powder did great in rubs for pork and chicken, and did great when dehydrated in pasta dough. The color of the dough was a dull brown so I added mushroom powder to it as well to get a very nice natural looking mushroom pasta. With all of this being said, I am happy with the product and will continue to produce as much as I can. There are still a few different techniques that I want to try but until then here is the “recipe”. Start by sterilizing all of your mason jars, you will need one mason jar per bulb of garlic, you do not want to stack or cram the garlic into the jars. 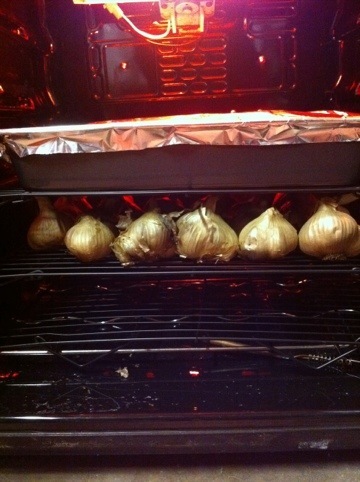 The warm air needs to flow evenly around the bulbs of garlic. Place a bulb of garlic in each mason jar and put the lid on finger tight. You do not want it too loose or the moisture from the garlic will escape. Wrap each jar with aluminum foil, this will ensure that the light doesn’t affect the product and will help keep the heat even in the glass jars. Place the jars in the warming box and keep the heat at 140°F for 30 days. After the thirty days are up remove the foil and lids of the mason jars, there will be a little pressure built up in the jar, the garlic will be a light brown color, and should smell sweet. Put the garlic back into the warming box without the lids for 10 more days, this will allow the garlic to dehydrate and concentrate the flavor. At the end of the 10 days remove one clove from a bulb of garlic and make sure that it has reduced in size by more than half. 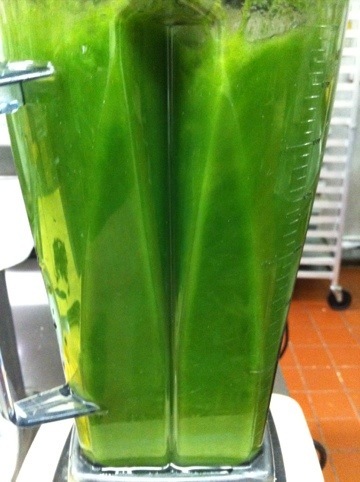 If not, then continue to dehydrate for 1-2 more days. Once it is black and the proper consistency remove the bulbs from their jar and let them air dry overnight on the kitchen counter. Store in the fridge or in a Ziploc bag in a cool and dark place until ready to use. There are so many uses for this product and I have posted a few uses throughout my blog. After another forty day cycle of fermenting garlic I was very eager to see how it turned out. From my last posts you can see the different process’ that I used to achieve this wonderful product. Of my four test subjects I have two that I am very happy with, and they all gave me great info for starting the next batch. Below are the pictures of the final products. The test on the far left was my favorite, followed by the one on the right. After the 40 days they both ended up with very close drying times. 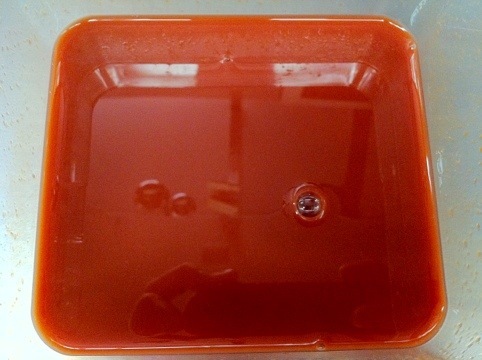 The sample on the bottom has a significantly shorter time to dry over the forty days, and the top sample dried to the point to where it is rock solid. 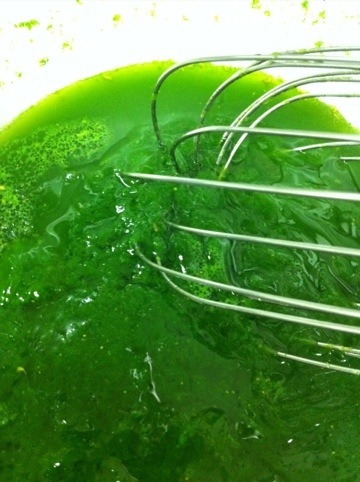 I plan on turning the hard sample into a powder to use in pasta dough, breads, and infusing oils. 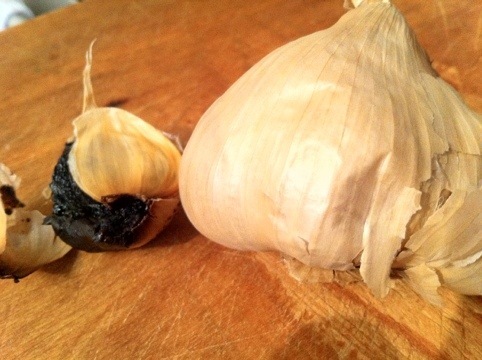 Again you can see my previous posts, Round 1 and Round 2 on the whole process of making black garlic. I have about twelve days left on the black garlic and all of the cloves are looking very promising. The third set is the only one that I am concerned about right now because the cloves are very dry but they do have that nice concentrated look to them. The fourth set has not been opened yet so they continue to look like the original batch of garlic that I made. I am very excited for this batch to be done so I can start producing larger batches! I should probably get serious every time I start these experiments, as I am not the type of person that likes to do things multiple times, but then again that doesn’t sound like much fun. So here goes the second round of black garlic, I am a week into it and have created many different conditions to hopefully yield a successful product in 40 days. With the first round of experimenting I found that I got the flavor and the aroma of black garlic, but not the distinct color that it is named for. That brings me to four different variables to allow the garlic to dry and concentrate in flavor. First set: 8 days with the lid and 2 days without, 8 days of drying total over the full 40. Second set: 7 days with the lid and 3 without, 12 days of drying total. Third set: 5 days with the lid and 5 without, 20 days of drying total. Fourth set: 30 days with the lid and 10 days without. All of the jars labeled A will be sprayed with water before their lid’s get put back on after each drying period, and jars B will not. The idea is to dry them but still keep the cloves moist. 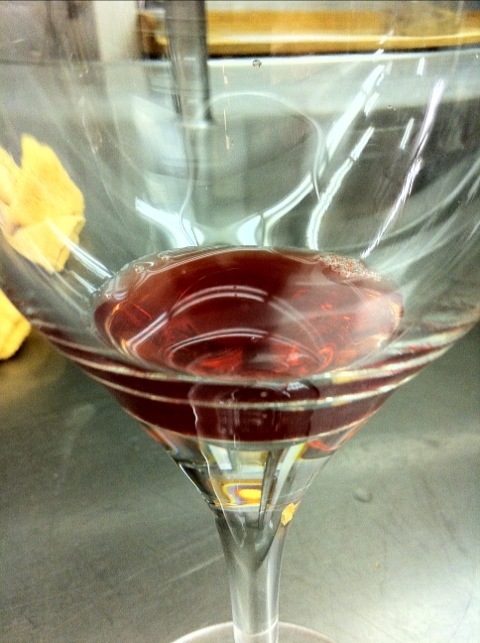 By adding a little water after drying I know that the cloves won’t dry hard. What I don’t know is if the garlic will have enough of its own moisture near the end of the test to not need any more added water, which is why I am trying the two variations.